When I was younger and didn't know about Kale or any greens other than canned spinach for that matter, I would have never imagined that I would be craving something intensely green and leafy. But after living with a veggie box as my primary source of produce for 6 years where greens filled out the box for 6 monhts of each year, I learned that you can do so much with kale, chard and all the others. I now always find myself missing greens in the summer when they don't grow so well. So when winter rolls around and they are everywhere, I now get excited! 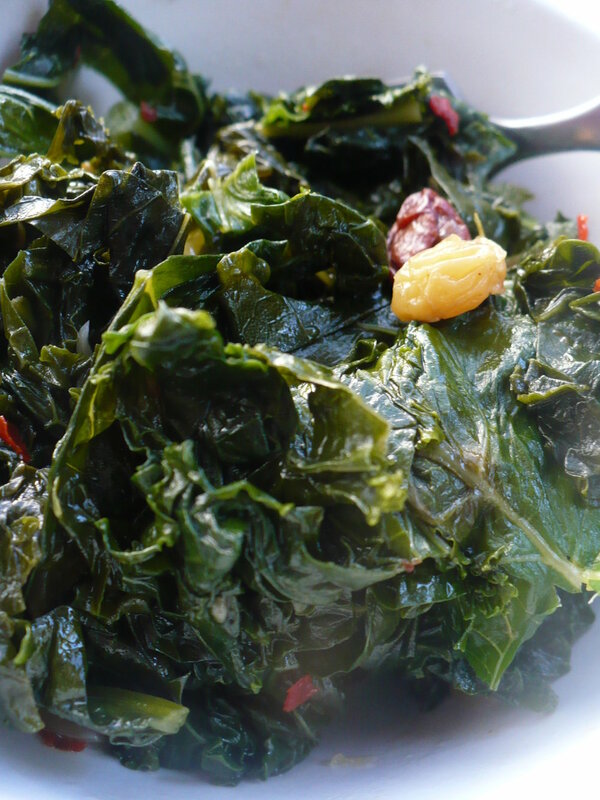 Kale is the popular kid of the group right now, but collards, chard and beet greens can all be substituted for kale in most of these recipes. (Sidenote: Did you know it's cheaper sometimes to buy beets with the greens rather than without. It's like buying two veggies in one for a discount!) Anway, back to kale, at the bottom of this post you will see my simple way of preparing greens for a side dish or to serve over rice, pasta or polenta but when you're wanting something a little more interesting, here are my top 10 ways to eat kale because life is too short to just drink your greens! Sauteed Kale & Smoked Mozzarella Pizza - Garlicky sauteed greens, smoked mozzarella (or regular if that's all you've got), pitted oil-cured black or Kalamata olives = YUM and healthy to boot. For a DIY Gluten-Free pizza crust try this one from Gluten Free on a Shoestring or this one from Minimalist Baker. Kale Chips - Eat an entire bunch of Kale by yourself? YES, You Can! Kale Sausage and Quinoa Salad - With white beans, lean sausage and quinoa, this is a protein powerhouse! Baby Kale and Sweet Potato Salad - This salad pretty much is a bowl full of antioxidants. Pine nuts are pricey, so feel free to sub almonds, hazelnuts or walnuts. Kale and Feta Breakfast Casserole - Make this in muffin cups for a quick breakfast. They can be frozen then you can reheat in toaster oven. Kale and Olive Oil Mashed Potatoes - This + Roasted chicken = Dinner. Kale, Cashew and Mint Slaw - Shutterbean.com - Sub thinly sliced apples or other fruit for the cabbage if you don't have it. Kale and Black Bean Burritos - Great for Meatless Monday option, for Gluten-Free, make tacos using corn tortillas instead. Garlicky Sauteed Kale with Polenta - This recipe uses chard, but kale is almost always interchangeable, maybe needing an extra few minutes of cooking time. Change it up by using chickpeas instead of peas. Also, I make polenta with almond milk only, no broth and I add butter and parmesan at the end. Kale and Polenta Lasagna - Kale and polenta again, but a little more fancy! Kale and Wild Rice Bowl - This looks so good, that I'm contemplating making it instead of pizzas now. This is the easiest way to prepare any kind of greens when you are just serving them with a side dish. This can also serve as a simple topping for polenta if you want to go even easier than the link I published above. The lemon juice (or vinegar) and raisins are great flavor balancers so don't leave them out. Place the olive oil, garlic, onion, red pepper and raisins in a large skillet over high heat. Once these start sizzling, pile in the greens, add water or chicken stock, 1 teaspoon or so of salt and toss. The greens will wilt depending on how mature they are within 5-10 minutes. If they are really substantial like collards, you can cover them and turn them down to medium low for 15-20 minutes. You don't want them to turn grey or a drab olive color so limit the time with the lid on. When they are tender enough for your taste, they are done. You can store them in your fridge and use for all kinds of quick recipes or serve right away.